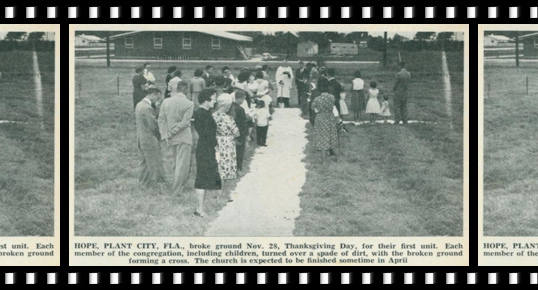 Hope Lutheran's first service was held on Sunday evening, February 24, 1957, in the Women's Club Room of the Plant City Library with 67 people in attendance. On May 28, 1958, the name Hope Lutheran was chosen to reflect the members' strong belief in the hope that Christians have, both now and in the life to come. On Sunday, November 30, 1975, Hope dedicated its Fellowship Hall to the glory of God. Ground was broken at the present location on November 28, 1963 (Thanksgiving Day). In 1977, Hope Lutheran School opened its doors and for 25 years offered the community a quality, Christ-centered education. Hope Lutheran has been blessed by God and strives to be a blessing in the community.